In 1922—three generations ago—Jim Morroni founded Electric Equipment & Engineering Co. (EEE), in Denver, CO, as a small firm selling motors and electrical systems. Today, the Morroni-family-owned business has evolved into leading manufacturer of power-distribution and transfer systems in all shapes and sizes, from 200- to 4000-A capacity. Among its products: transfer switches, integrated load centers, power-distribution switchgear and circuit-breaker motor operators. As an integrated manufacturer looking to keep sheetmetal fabrication as an inhouse core competency, the first fabrication machines installed at EEE were two single-station punch presses, which served the company well for many years. More recently, to meet rapidly growing demand for just-in-time deliveries, EEE’s Greg and Tim Morroni went in search of more productive fabrication equipment. In 1999, the firm invested in a Finn-Power P5 hydraulic turret punch press; in 2000 it added a Finn-Power F5 hydraulic turret punch press. 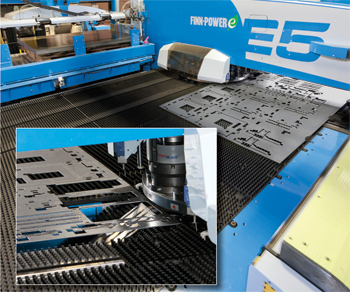 EEE’s newest turret punch press, a servo-electric model, offers programmable position and speed of the punch and die—one setup can handle punching, nibbling, cutting, forming (to 0.63 in. high), marking, bending and tapping. Inset: The large work chute of the press allows quick removal of parts as large as 19.6 x 19.6 in. In 2005, strong demand for the firm’s integrated load centers required the addition of a Prima Finn-Power C5 Compact Express turret punch press, providing its fabrication shop with unmanned operation through its highly compact load/unload automation. Last but not least, early in 2009 the firm added an E5 Compact servo-electric turret punch press, which offers programmable position and speed of the punch and die—one setup can handle punching, nibbling, cutting, forming (to 0.63 in. high), marking, bending and tapping. The punching process of the E5 combines servo-electric technology with mechanical power transmission, enabling strict punch control. A servomotor together with a lead screw moves a roll that in turn moves the ram by means of a guiding surface. Punching and forming strokes are based on horizontal movement, made by a servo motor, converted into vertical ram movement and transmitted to a punching or forming tool. In the punching mode, the roll moves horizontally over the top of the guiding surface, producing a punching stroke during each movement. The punching stroke is generated by a servomotor-driven mechanism. The latest generation of the precision servo-electric turret punch presses represents a growing trend in the industry. Their precise upper and lower ram movements help to create special flanges and forms, reducing the need for secondary operations. And, servo-electric turret presses minimize connection power and power consumption—recent tests prove that by using a creative combination of servo-electric technology and mechanical power transmission, a servo-electric turret press consumes less than one-third the amount of electric power of a comparable hydraulic turret press. Servo-electric turret punch presses also offer adaptive reduced ram speed, which supports numerous operations including the forming of louvers, knock outs and shear tabs, and also proves beneficial for embossing and part marking. Some of the latest turret-press models feature programmable clamp setting that automatically positions sheet clamps. The possibility of punching the clamps is eliminated, and programming is easier. And, when changing production from full size to small sheets, clamp settings can be made automatically without wasting operator time. Dead zones can be completely eliminated by using individual one-clamp movement while the other clamp holds the sheet. This allows 100 percent utilization of the material. Punch stroke is numerically controlled by the CNC, which provides a fast and optimal stroke. The stroke position and speed are controlled by the CNC. With forming tools, EEE programs a lower ram speed, forming speed and positioning tolerance. “We were pleasantly surprised by the increased accuracy of the servo-driven punch,” says Greg Morroni, adding that the increased accuracy of the E5 allowed the company to redesign a line of fabricated outdoor power boxes to eliminate welding. • Individual tool holders that allow the company to design their own turret layouts. Any tooling style from Mate Precision Tooling or Wilson Tool Intl. can be installed in the turret, as well as up to 10 auto-index, forming, or Multi-Tool stations. • EEE has five full-tonnage auto index stations on its machine, which precisely rotate the punch and die in their tool holders in 0.001-deg. programmable increments. • EEE has four Multi-Tool stations to increase the number of tools available in a turret, reducing setup time and increasing productivity. Multi-Tool stations offer six, eight, 10, or 24 punch/die combinations in only one station, establishing a turret within a turret. • Upforming operations to form louvers that allow air flow through EEE’s boxes have improved thanks to the machine’s capabilities to form to 0.63 in. height and 5-in. dia. • The tapping feature of the E5 pays a big dividend to EEE. The company selected a six-station servo-driven tapping unit. Explaining its payback, Tim Morroni describes a motor-base part that has 40 tapped holes in three different sizes. The final piece of equipment added to the EEE sheetmetal-fabrication shop was a servo-electric press brake, which Greg Morroni credits with improving the shop’s bending speed and accuracy. “The new brake (an E Series model from Finn-Power) forms our parts more quickly and the increased precision dramatically reduces assembly time. Information provided by Finn-Power Intl., Arlington Heights, IL: 847/952-6500, www.finnpower.com.